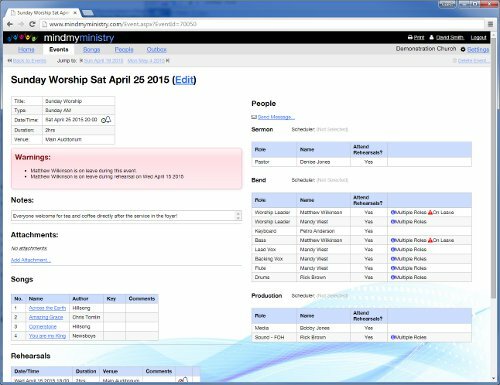 MindMyMinistry - Church service scheduling, rostering and worship planning software. We help make your services run smoothly with our service scheduling and automated email reminders. Our church worship planning system makes rostering volunteers easy. 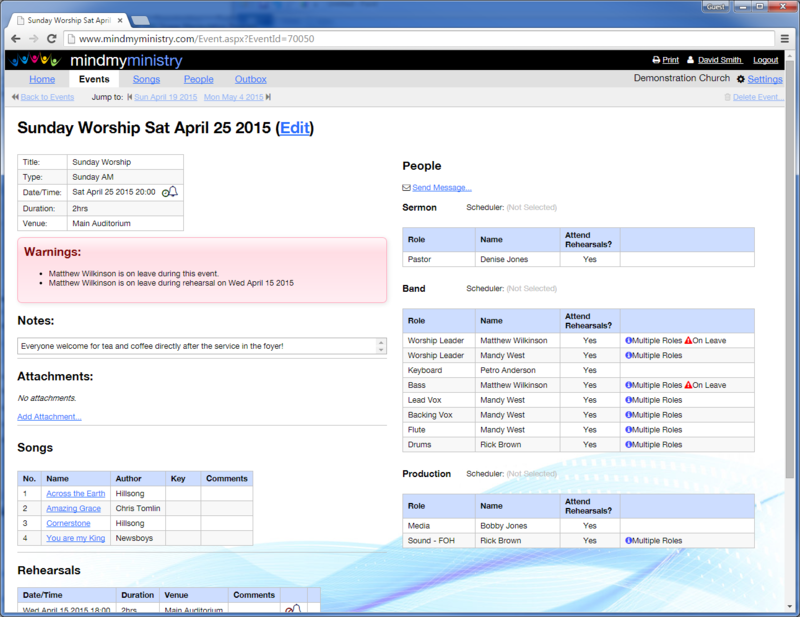 Everyone gets their own login and can see all their commitments at a glance, including rehearsal dates and songs. Plan your services and events online. Automatic email reminders for services and rehearsals. Send emails and SMS messages to your team. Share resources with your team using our built-in online file storage. Address book keeps details of volunteers, musicians and staff. Rostering of bands/band members, production/sound/media operators. Track everyone's leave in a central place. Identify rostering issues ahead of time. Keep a library of songs, chord sheets, MP3s and YouTube links. 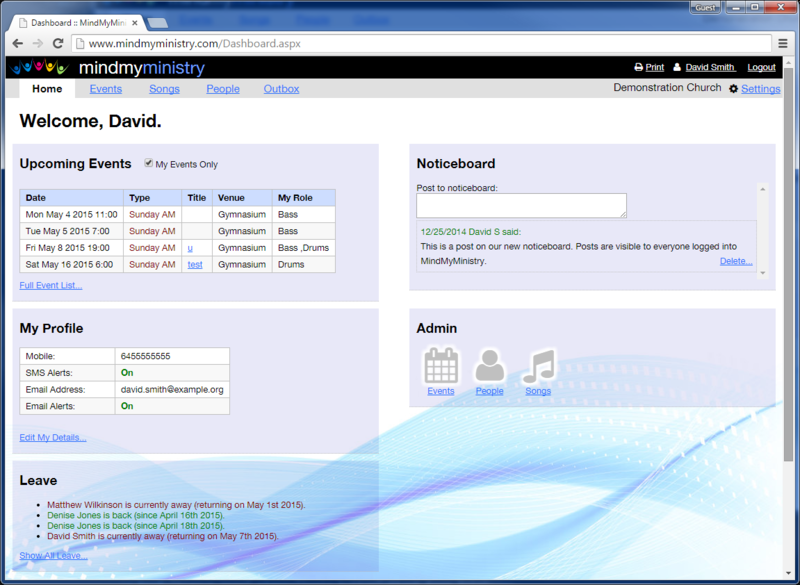 Dropbox integration: Share your files with MindMyMinistry. New! 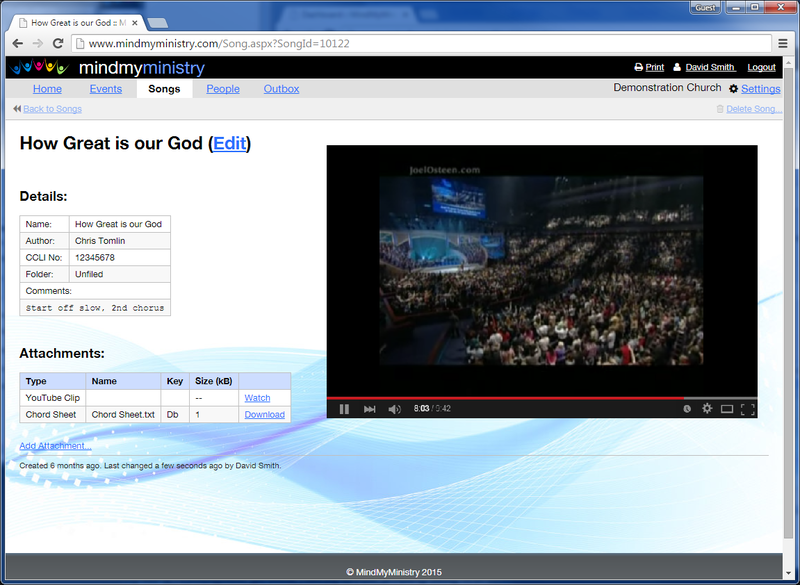 Quickly transpose chord sheets with our new SmartChord editor. All our plans come with no setup fees and no contracts. Cancel anytime. "... It takes just a few minutes to realize how a helpful and powerful tool this program is." "This is a great product, not just to add song[s], set lists and events, but also to communicate with the team! ..."
"... The great thing about the program is it is user friendly. ... Most work is done even long before a Sunday starts and takes all the stress related issues away of Sunday services." "We have really enjoyed using Mind My Ministry. ... The customer service has been outstanding ... Our church loves it."